I wouldn’t ever claim to be an expert in time management. Ironically enough, I didn’t even find the time to finish reading David Allen’s book ‘Getting Things Done’ (aka GTD). What I have learned over the last few years are a few useful tricks and tools to help manage a busy day at work and not go home at night fretting about all the things that need to be done tomorrow. I appreciate that many people use the full GTD system and find it of great benefit but it’s not my style. What follows is what I’ve found to work for me. I find it useful to use a system that’s on my computer as that where I do the bulk of of my work but I prefer a tool that’s clean and simple. I don’t want to be assigning ‘contexts’ and next actions and weekly reviews. This level of GTD works for many but it’s too much detail for me. 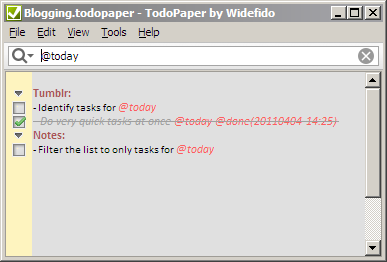 After trying a lot of the tools that are available I was happiest with TodoPaper by Widefido which is a very simple to-do list manager. Usefully for me it uses a similar (plain text) file format to TaskPaper for the Mac. When I first posted this I didn’t put enough emphasis on the benefits of these applications using plain text files. I’ve added a bit more about this here. 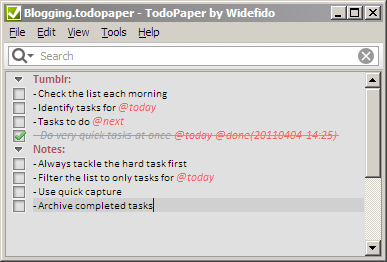 The main window of TodoPaper is very simple and is broken down into projects and tasks and can be quickly filtered down to a subset of these. The application also provides a quick entry panel triggered by a system-wide hot key which allows new tasks to be entered without having to switch to the main window. This is great for me because it means new tasks can be entered very quickly without the distraction of leaving whatever I am currently working on. 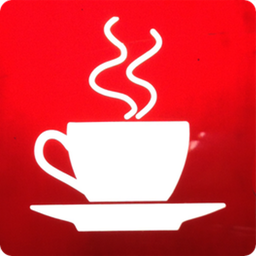 1 Review the list of tasks each morning and identify those to complete that day. I use the @today tag for this. 2 Identify the tasks to complete after these or @next 3 Filter the list to only show today’s tasks (I get distracted otherwise) 4 Tick off each task as it’s completed. 5 At the end of the day take a couple of minutes to review tasks. Once today’s tasks have been defined I find it invaluable to tackle the hardest one first. If this turns out to be easier than expected it’s good to get it out of the way; if it’s harder than expected you find out sooner and can break it down into more manageable chunks and plan to complete it. If they can be completed in less than a couple of minutes just do them. If they need any longer than that add them to the list, tag them for @today if necessary but use the quick entry panel to make this as ‘frictionless’ as possible. Most important thing of all? Archive completed tasks at the end of the day while reviewing open tasks - it feels good to see them disappear!